St. Innocent of Alaska On "Let him deny himself, take up his cross, and follow Me"
[L]et us look at the ways by which we must follow Jesus Christ. He said, Whoever wishes to follow Me, 1) let him deny himself, 2) take up his cross, and 3) follow Me. And so the first duty of a Christian, of a disciple and follower of Jesus Christ, is to deny himself. To deny oneself means to give up one's bad habits; to root out of the heart all that ties us to the world; not to cherish bad desires and thoughts; to quench and suppress bad thoughts; to avoid occasions of sin; not to do or desire anything from self-love, but to do everything out of love for God. To deny oneself means, according to the Apostle Paul, to be dead to sin and the world but alive to God. A Christian's second duty, that is, in following after Jesus Christ, is to take up his cross. The word cross means sufferings, sorrows, and adversities. There are external and internal crosses. To take up one's cross means to accept and to bear without murmuring everything unpleasant, painful, sad, difficult, and oppressive that may happen to us in our life. And therefore, whether anyone offends you, or laughs at you, or causes you weariness, sorrow, or annoyance; or you have done good to someone and, instead of thanking you, he rises up against you and even makes trouble; or you want to do good, but you are not given a chance; or some misfortune has happened, for example, either you are ill yourself, or your wife, or children; or with all your activity and untiring labors you are suffering from want and poverty, and are so hard up that you do not know how to make both ends meet; or besides that, you are in some difficulty−bear all this without malice, without murmuring, without criticism, without complaint, that is, without regarding yourself as offended and without expecting any earthly reward in return; but bear it all with love, with joy and firmness. 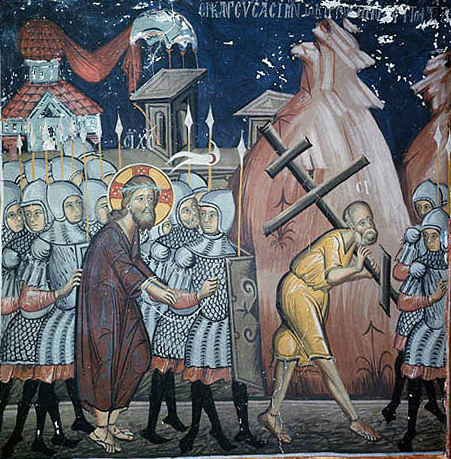 To take up one's cross means not only to bear crosses laid on us by others or sent by Providence, but to take and carry one's own crosses, and even to lay crosses upon oneself and bear them. This means that a Christian can and should make and keep various vows and promises that are troublesome and burdensome for one's heart; but they should be vows in conformity with the Word of God and His will, and not according to our own ideas and fancies. Thus, for example, one can and should make and keep vows useful to one's neighbors, for example, to tend the sick; to help practically those in need of help; to seek out cases; and with patience and meekness to work for the salvation and welfare of others, either by action or by word, or by advice, or by prayer, and so forth. nd if when you are bearing your cross according to the word and intention of the Lord a proud thought rises up within you, that you are not like other people but firm, pious, and better than your neighbors and companions, uproot such thoughts as far as possible, for they can destroy all your virtues. It was said before that there are external and internal crosses, but so far we have spoken almost entirely about external crosses. And blessed is he who can bear them wisely and well, for the Lord will not let such a man perish, but He will send him the Holy Spirit Who will strengthen and guide him and lead him further. But to become holy and be like Jesus Christ, merely external crosses are not enough; for external crosses without internal ones are of no more use than external prayer without internal prayer. Outward crosses and outward sufferings are borne not only by disciples of Jesus Christ, but by all and everyone. There is not a man on earth who has not suffered in one way or another. But whoever wants to be a true disciple and follower of Jesus Christ must bear without fail internal crosses as well. Internal crosses can be found at all times, and more easily than external ones. You have only to direct your attention to yourself and to examine your soul with a sense of penitence, and a thousand internal crosses will at once present themselves. For instance, consider: How did you come to be in this world? Why are you in this world at all? Do you live as you ought to live? And so on. Pay due attention to this, and you will see at first glance that, being the creation and work of the hands of Almighty God, you exist in this world solely, with all your actions, with all your life, and with your whole being, to glorify His holy and great Name. But you not only fail to glorify Him, but on the contrary you offend and dishonor Him by your sinful life. Then recollect and consider: What awaits you on the other side of your grave? On which side will you be at the time of Christ's dread judgment, on the left or the right? And if you reflect in this way, you will inevitably be alarmed and will begin to be disquieted. And this will be the beginning of internal crosses. But if you not only do not banish such thoughts from you, or seek diversion from them in worldly pleasures or empty amusements, but still further and more attentively examine yourself, you will find still more crosses. For example, hell, which up till now you have perhaps scarcely thought of, or have thought of with indifference, will then appear to you in all its horror. Paradise, which the Lord has prepared for you and to which you have hitherto hardly given a thought, will then become to you the living reality that it actually is, a place of pure and eternal joys of which you are depriving yourself by your carelessness and stupidity. And if you do not pay any attention to the troubles and inner sufferings that you feel from such thoughts, and firmly resolve to bear them without seeking consolation in anything earthly, but pray more fervently to the Lord for your salvation and surrender the whole of yourself to His will, then the Lord will begin to show and reveal to you the state of your soul as it really is to introduce and nourish within you fear, affliction, and sorrow and thereby purify you more and more. We can never see the state of our soul in all its nakedness or vividly realize its danger without the special grace and help of the Lord, because the interior of our soul is always hidden from us by our self-love, prejudices, passions, worldly cares, and delusions. And if it sometimes seems to us that we see the state of our soul ourselves, yet we see it only superficially and no more than our own reason and conscience can show us. Knowing how good for us it is to examine and see the state of our soul, the enemy of our soul (the devil) uses all his wiles and cunning to prevent us from seeing the state in which we really are, lest we should be converted and begin to seek salvation. But when the devil sees that his wiles do not help and that the man with the help and Grace of God is beginning to see himself, then the devil employs another still more crafty means-he endeavors to show a man the state of his soul suddenly and, as far as possible, more from the dangerous side, so as thereby to strike the man with terror and lead him to despair. And if the Lord were actually to allow the devil always to use this last means, that is, to show us the state of our soul from the most dangerous side, few of us would stand firm; because the state of the soul of a sinner, and especially of a sinner who has not repented, really is extremely dangerous and terrible; and not only the soul of a sinner, but even the most holy and righteous people, with all their righteousness, could not find tears enough to weep for their soul. When the Lord is pleased to reveal to you the state of your soul, then you begin to see clearly and to feel acutely that with all your virtues your heart is corrupt and perverted, your soul is defiled, and you yourself arc only a slave of sin and the passions that have completely mastered you and do not allow you to draw near to God. You also begin to see that there is nothing truly good in you, and even if you have some good works, they are all mixed with sin and are not the fruit of true love but are the product of various passions and circumstances; and then you will certainly suffer. You will be overwhelmed with fear, sorrow, misery, and so forth-fear because you are in danger of perishing; sorrow and misery because you have so long and so stubbornly closed your ears to the gentle voice of the Lord calling you into the heavenly kingdom and you have so long and so brazenly angered Him with your sins. And in proportion as the Lord reveals to you the state of your soul, your internal sufferings will also increase. Now you see what internal crosses are! Just as not all people have the same virtues and the same sins, so internal crosses are not the same for all. For some, they are more oppressive " and for others less•, for certain people, they are more prolonged, and for others, less; for some they come in one way, and for others, quite differently. And all this depends on the state of each person's soul, just as the length and mode of cure of an illness depends on the patient's condition. It is not the doctor's fault if he must sometimes use violent and prolonged means for the cure of a chronic and dangerous illness that perhaps the sick man himself irritated and increased. Whoever wants to be well will consent to bear everything. Internal crosses are sometimes so burdensome that the sufferer can find no consolation whatsoever in anything. All this can happen to you too! But in whatever position you may be, and whatever sufferings of soul you may feel, do not despair and do not think that the Lord has abandoned you. No! He will always be with you and will invisibly strengthen you even when it seems to you that you are on the very brink of perdition. He will never allow you to be tempted more than He sees fit. Do not despair and do not be afraid, but with full submission and devotion to Him, have patience and pray. For He is always our Father, and a very loving Father. Even if He permits a person who has surrendered to Him to fall into temptation, yet it is only to make him realize more clearly his own impotence, weakness, and nothingness and to teach him never to trust in himself and to show that no one can do anything good without God. And if the Lord leads a person into suffering or lays crosses upon him, it is only to heal his soul, to make him like Jesus Christ, and to perfectly purify his heart, in which He Himself wishes to dwell with the Son and the Holy Spirit. In these troubles of yours, however trying they maybe, do not seek consolation among men unless the Lord specially indicates it and sends you His chosen servants. Ordinary people, that is, those who are not experienced in spiritual matters, are always bad comforters, even in ordinary sorrows, and still more in spiritual sorrows and troubles from the Lord, which they do not even understand; in this case, they are more likely to do you harm than to comfort and relieve your sufferings. The Lord Himself is your Helper and Comforter and Guide; run to Him alone, and in Him alone seek consolation and help. Blessed, a hundred times blessed, is the person whom the Lord grants to bear internal crosses, because they are the true healing of the soul, the sure and safe way of becoming like Jesus Christ, and consequently they are a special and manifest favor of the Lord, and they show clearly His care for our salvation. Blessed is that man also because he is in a state of grace to which we not only cannot attain without the assistance of the Grace of God but do not even consider necessary for our salvation. If you bear your sufferings with submission and surrender to the will of the Lord and do not seek consolation anywhere or in anyone except the Lord, then in His mercy He will not abandon you and will not leave you without consolation; He will touch your heart with His Grace and will communicate to you the gifts of the Holy Spirit. Amid your sufferings, and perhaps even at the very beginning of them, you will feel in your heart ineffable sweetness, a wonderful peace and joy that you never felt before, and at the same time, you will feel within you the power and ability to pray to God with true prayer and to believe in Him with true faith. Then your heart will burn with pure love for God and your neighbor. All this is a gift of the Holy Spirit. And if the Lord grants you such a gift, whatever you do, do not regard it as a reward for your labors and troubles, and do not think that you have attained perfection or sanctity. Such thoughts are inspired by pride that has so deeply penetrated our soul and has taken root so strongly in us that it can make its appearance even when a person has miracle-working power. These consolations and touches of the Holy Spirit are not a reward, but only the mercy of the Lord Who grants you to taste the good things that He has prepared for those who love Him, so that having tasted them you may seek them with greater zeal and fervor, and at the same time may prepare and strengthen yourself to endure fresh troubles and sufferings. And the love that you feel at that time is not the perfect state to which the saints attain on earth, but only an indication of it. The third duty of the disciple of Jesus Christ is to follow Him. To follow Jesus Christ means to imitate in all our works and acts the works and acts of Jesus Christ. Just as Jesus Christ lived and acted on earth, so we should also live and act. For example, Jesus Christ always gave thanks and praise to God His Father, and always prayed to Him. So too in every state and in all the circumstances of our life we should thank God, love Him, and both publicly and privately give praise to Him, pray to Him, and always have Him in our minds and hearts. Jesus Christ honored His immaculate Mother and His foster father and superiors and obeyed them. In exactly the same way, we, too, should honor and obey our parents and teachers and not irritate or grieve them by our behavior, and we should respect our superiors and all authorities (called of God), and we should submit to them and obey them without a murmur. Jesus Christ, the universal King, paid tribute (tax) to the earthly king, and the Judge of the living and dead was unwilling to take upon Himself the civil authority of a judge or arbitrator (Luke 12:14). Just so, we ought to pay the taxes to our king without any murmuring, and we ought not to take upon ourselves any authority that does I not belong to us, for example, the authority of a judge, and condemn (or criticize) those in authority. Jesus Christ fulfilled the duty He undertook and the work for which He was sent into the world willingly and with zeal and love. In exactly the same way, we too should carry out such duties as are assigned to us by God and the king (or government) conscientiously, willingly, and without murmuring, even though our duties may be difficult or menial. Jesus Christ loved everyone, and did every kind of good to all. So we too should love our neighbors and, as far as possible, do good to them by deed, or word, or thought. Jesus Christ gave Himself up for the salvation of men. So too, in order to do good to people, we should not spare our labors or help. For the salvation and defense of our king and country (the king being the father of the nation) we should not spare even our life itself; whereas Jesus Christ, as our Redeemer and Benefactor, we should not spare the very comforts of our soul, nor our body, nor our life, as did the holy martyrs who suffered various tortures and death for Jesus Christ. Jesus Christ willing surrendered Himself to suffering and death. So, too, should we not avoid the suffering and sorrows sent us by God but out to accept and bear them with humility and surrender to God. Jesus Christ forgave His enemies all that they did to Him, and over and above that, He did them every kind of good and prayed for their salvation. So too should we forgive our enemies, repay with good the evil done us, and bless those who curse and abuse us, with full faith and hope in God, the most just and all-seeing Judge, without Whose will not even a hair of our head will be lost. By bearing wrongs without complain, without revenge, and with love, you will act as a true Christian (Matt 5:44; Lk. 6:28). Jesus Christ, the King of heaven and earth, lived in poverty and earned His living by His own labors. So too should we be industrious and have a love of work, and seek without laziness what is necessary for our life be content with our state and not desire wealth; because, according to the Savior's word, it is easier for a camel to go through the eye of a needle than for a rich man to enter the kingdom of heaven. Jesus Christ, being meek and humble in heart, never sought or desired praise from others. So too should we never boast or pride ourselves on anything at all or seek praise from others. For instance, if you do good to others, if you give alms, if you live more piously than others, or if you are more intelligent than many, or in general if you are better and more distinguished than your fellows, do not be proud of it either before men or to yourself, because all that you have that is good and praiseworthy is not yours but the gift of God− only sins and weakness are your own, and all the rest is God's. To follow Jesus Christ means also to obey the word of Jesus Christ. Therefore, we must listen to, believe, and fulfill all that Jesus Christ has said in the Gospel and through His apostles, and we must do all this without philosophizing and in simplicity of heart.